PLEASE NOTE THIS HANDSET IS FOR PRE ORDER ONLY WITH APPROXIMATE RELEASE DATE OF 12TH APRIL FOR SIM FREE STOCK. RELEASE DATES ARE SUBJECT TO CHANGE AT ANY TIME, AS THEY ARE RESPONSIBILITY OF THE MANUFACTURER AS SUCH ARE OUT OF OUR CONTROL. STOCK WILL BE IN CONSTRAINT AT LAUNCH SO PRE ORDERS ARE ON A FIRST COME FIRST SERVED BASIS & DELIVERY MAY TAKE BE DELAYED DEPENDING ON EXPECTED POPULARITY OF PRE ORDER. The new periscope telephoto lens allows more optical zooming capabilities to be tucked in a compact body without losing image quality. Together with the colour saturatio provided by the 40 MP main camera, and stability of OIS, the SuperZoom Lens offers 10x hybrid zoom1 to see the never-before-seen with great resolution and rich detail. Additionally, it can bring the moon right before your eyes with up to 50x zoom. Analysing hundreds of thousands of backlight and low light photos, AI HDR+ delivers clarity in your shots with the AI evaluating several frames and segmenting different parts of the photo to combine the best features. The light and colour are balanced in different layers to bring your face into focus. The improved performance of the Kirin 980 mobile process chipset, along with lower power consumption. Complimented with 8GB RAM and 128GB of internal storage, make the Huawei P30 Pro a powerhouse of a smartphone. Which excels are when you are playing the latest demand games or need to use multiple apps. Brighter, wider and closer. See the world from new perspectives. Discover the unseen surprises and turn them into your treasured memories. The HUAWEI P30 Pro is pushing the envelope of smartphone photography. The Kirin 980 is the world's first 7nm mobile process chipset with stronger performance and lower power consumption. 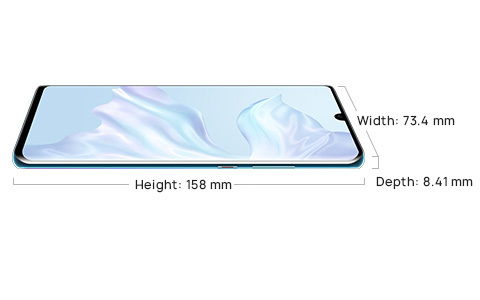 This innovative chipset plus up to 6GB of RAM and 128GB of memory storage,4 reveal a performance powerhouse in the HUAWEI P30 Pro. *IP68 is splash, water, and dust resistant and were tested under controlled laboratory conditions with a rating of IP67 under IEC standard 60529. Splash, water, and dust resistance are not permanent conditions and resistance might decrease as a result of normal wear.